The Delhi High Court judgment on Section 377 of the Indian Penal Code, which criminalised homosexuality, shook up the Indian establishment, due not only to its radical stance, but also to the outpouring of support from so many segment of Indian society. For this reason, the Supreme Court’s rejection of the judgment came as a surprise. An editorial in this issue argues that homosexuality can in no way be seen as deviance or psychopathology. Another examines the merits of the long awaited seventh revision in the Declaration of Helsinki. An editorial comments on the phenomenon of predatory publication – fly-by-night operators claiming to be academic journals. It was one of the diseases we thought we had defeated. Unfortunately, tuberculosis has bounced back in frightening forms. 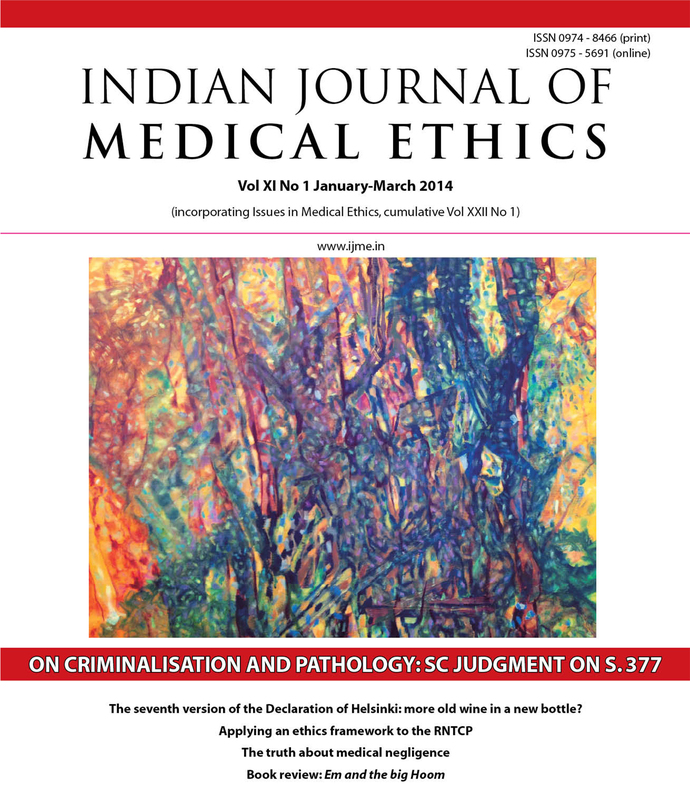 Two articles apply ethical principles to critical evaluation of the Revised National Tuberculosis Control Programme and its effectiveness. Another studies the ethical challenges faced by medical students at work. Data documentation and informed consent need constant vigilance, and two studies analyse these essential features of clinical research. A commentary looks beyond the hype of surgery to pre-empt breast cancer. Another discusses surrogacy. We have two comments which examine whether strikes by doctors are always to be condemned; and whether medical negligence is invariably the result of laxity, and can hence be done away with. We wish our readers and contributors a happy, fruitful and healthy new year, and look forward to more and more stimulating articles to keep alive the ethics perspective in healthcare. The new 2013 seventh version of the Declaration of Helsinki – more old wine in a new bottle?